Over in the left hand sidebar, I have listed under the recommended hardware section an S-Video to VGA converter. There are lots of these available on eBay and direct from manufacturers. They come in various sizes, with various bells and whistles and hitting a range of price points. I've purchased a few over the years, but I was looking for something better than what I had. This is a review of my latest find. Also, its claim to be mini is pretty accurate too. It only measures about 2" x 2" by 1", so it's very small. I also really like the fact that it's squarish with flat parallel sides and edges. Many of these converters you'll find have curved cases. Frankly, I don't know why anyone makes them with a curved case. Maybe it's to make them look cool, but what it does is makes them hard to stack or mount. The Portta mini is ideal in both size and shape. Its job is super simple: It converts video that a C64 outputs to VGA so you can use a more modern VGA monitor instead of an ancient CRT. It has two inputs, a CVBS composite video female RCA jack, and a female mini-din S-Video jack. The flat C128, C128D and all but the oldest C64's output "split" video via two RCA jacks. With a special cable, which you can either build or buy, that C64 "split" video output is 100% compatible with the very common S-Video. The S-Video port on the converter provides far and above the best quality output. But, if you're using it with an older C64 that only has composite video out, you can still use this and it still looks pretty good. There is a switch on the side to choose between the two inputs. Its output is a standard VGA port. Its power comes from a USB port and it comes with a short USB-A cable. It doesn't come with a power supply but frankly, I'm okay with that. I've got mine hooked up to one of those very tiny iPhone USB chargers and it works brilliantly. The only other control on this converter is a resolution button which I'll mention later. The quality of this converter is surprisingly great. I happen to have a 1084 CRT monitor. It's also really great, a 4x8 (Soft 80 Column) font is clear and easily legible. The downfall of those soft-80 fonts is that a lot of displays are just so fuzzy that it makes the tiny text impossible to read. Here's the problem, though. It's tough to get your hands on a really high quality 1084 or 1048s (even better) Commodore Monitor. Plus, they're really heavy, often have an obnoxiously loud buzz or whine, and frequently have bits and pieces broken or not working. My 1084 buzzes something awful, is missing the front flap that covers the control knobs, has a strange discoloration in the bottom left corner of the screen and has a tempremental power switch. I still use it, because overall the image quality is so great. Instead of just describe the quality of the Portta Video Converter, I'll show it with a few photos. Here are a couple of close up shots of Wheels. Wheels uses proportional fonts, so the font isn't strictly 4x8, but it does use single pixel wide strokes. Let me tell you, this looks great! That ram expansion warning text is highly legible. Every pixel is clearly visible. This is, in my opinion, toe to toe with the best Commodore CRTs. The quality drops a little bit when colors are used, but it still looks very sharp. Next is a comparison of the Portta with VGA monitor vs a 1084 CRT, in Novaterm with a true 4x8 font. In the above comparison image, the top is through the VGA video converter, the bottom is the 1084 CRT. There are a few obvious differences. The individual pixels of the 1084 look blurrier to my eyes, mostly because of the visible rasterlines. The VGA converter draws the pixels solid. The colours are more vibrant on the VGA display too. The only downside is that the more vibrant colours tend to bleed more. In my overall estimation, it's a toss up between which is better. But if you don't have a really great CRT, then the video converter is a real great option. Now, there are a couple of caveats. The images above were taken with the Video Converter hooked up to my flat C128. For some reason, not every machine I hooked it up to looked as good. A C64c I tried looked sharp, but there was vertical banding. So, vertical strips at the READY prompt blue screen where alternating strips had a different shade of blue. And on a C128DCR I hooked it to, things went really bad. The resolution with S-Video was very poor quality, again, I have no idea why. But the results do vary depending on the machine it's hooked up to. Alternatively, if I used the composite video connector on the C128DCR, it looks really great! The quality is not as crisp as S-Video when that works best, but still pretty good. Eminently usable for anything that doesn't require reading pixel fonts for hours on end. The quality of the text is, again, really really great. But I do not know what exactly is causing the rainbow bar. The good news is that it only appears in the upper border, so it doesn't interfere with anything on screen. And also, it seems to disappear whenever the colours on the screen and border a varied. Here you can see the Portta Video Converter hooked up to a C64c via a homemade S-Video adapter I put together. However, if you're not handy with a soldering iron or don't want the hassle of purchasing the connectors separately, you can buy Commodore Video to S-Video (plus mono audio on either one or two RCA jacks) from eBay for less than $20. I've shown a picture of one in the left sidebar. In short, if you need a good monitor for your C64 or C128, you don't have to buy and ship an older CRT, you can get an S-Video to VGA converter for between $20 and $30 and the VGA displays are a dime a dozen. Believe it or not, I picked up that 15" Samsung VGA LCD display for free. 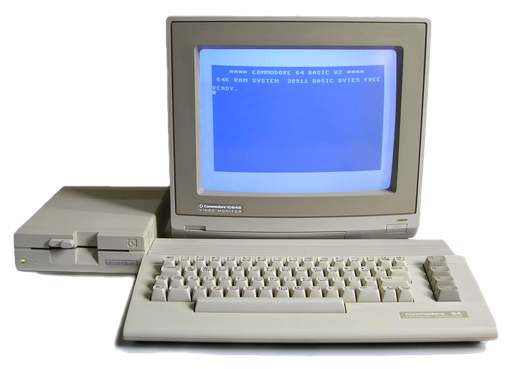 Nobody in PC-land wants it anymore, but for a Commodore it's perfect. It's even 2" diagonally bigger than a standard 13" Commodore CRT.